Product information "POPP 10-Years Smoke Detector with Siren Function"
The Z-Wave smoke detector detects resulting fire and smoke emission reliable. In case of emergency it alarms acoustically.Thanks to Z-Wave wireless technology, you can define further actions triggered by the smart home control center in case of an alarm. To enhance safety, escape routes can be highlighted through automatic lighting, opening shutters and unlocking doors. If an electrical device (e.g. iron) is the causer for the alarm, it can be switched off automatically (if plugged to an intelligent wall plug). With its integrated 10-year battery the smoke detector can be used for legally prescribed lifecycle without replacing the main battery. The Z-Wave modules battery can be replaced with just a few simple steps when the device informs the control center about low battery status. Low Z-Wave module battery has no influence to the smoke sensors functionality. 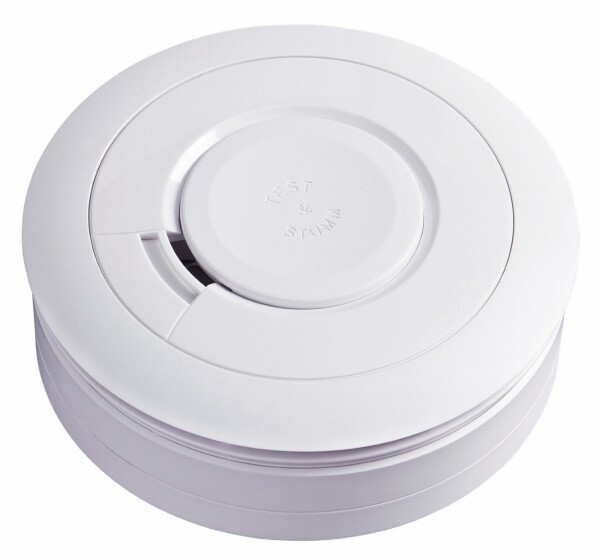 A stand-alone smoke detector head that does not only fully comply to the European regulation EN14604 but to the much more advanced guideline vfdb 14-01. This means that the device – among others – ensures a 10 year battery life of the internal battery, is more resistive against mechanical stress and extreme temperature changes, and it is manufactured according to the advanced manufacturing standard UPC-2. A wireless communication module, that has its own separate and replaceable battery. This module fits into the module bay of the smoke detector head and establishes a communication link to a central Z-Wave gateway reporting its battery status and of course any alarm condition. The module is certified according to the Z-Wave Plus guidelines. Additional functionality of this high end smoke detector includes periodic automated self test, dust compensation and special functions for sleeping rooms (no blinking) and easiness of use (large button for testing to be operated by a simple broom stick). Furthermore the device can be used also as an independent indoor siren within the Z-Wave network. Connected to different sensors via control center it will alarm in case of detected flood or burglary additionally to smoke or fire alarm. Yon don't need to install another stand-alone siren. Related links to "POPP 10-Years Smoke Detector with Siren Function"